There are plenty of reasons to avoid artificial food dyes. Studies have linked them to behavioral problems in children, including hyperactivity(1) – and a report from Perdue University estimates that many food products contain more artificial food coloring today than they did years ago(2). At the same time, conscious parents are increasingly making the decision to avoid store-bought marshmallows. An outbreak of salmonella in marshmallows made using raw egg whites in 1996 still had some parents wary of these fluffy treats(3). Allergies to certain types of gelatin can also make marshmallows dangerous territory for some kids(4). Making your own marshmallows is easy and fun. There are all sorts of alternatives to store-bought food dyes that can add extra flavor to your homemade snacks. 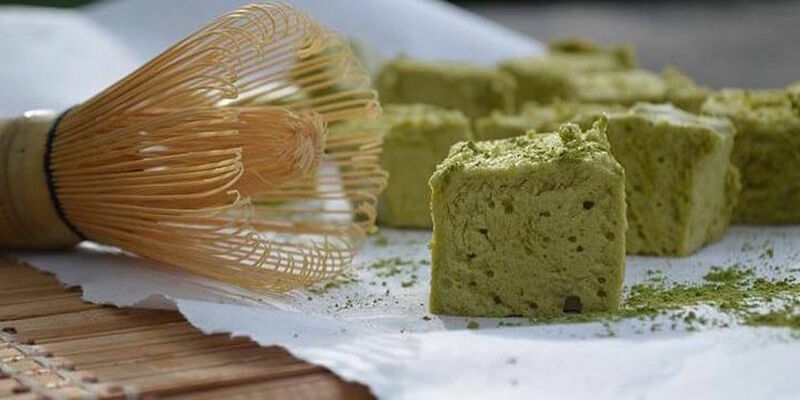 Here’s a recipe for homemade matcha marshmallows. These marshmallows are sweet and fluffy, with a natural light green color and the pleasant but mild flavor of matcha – just like you might add to your coffee for an extra boost. Pour half a cup of water into a metal bowl and add the gelatin, whisking the ingredients together until the gelatin has been incorporated into the water. Let this mixture sit while you pour another half a cup of water along with the cup of honey or maple syrup into a small saucepan. Bring it to a slow boil until it reaches at least 240 degrees. Slowly begin pouring the honey mixture into the bowl of gelatin mix – the gelatin should be hardened by now – and use a hand mixer to blend the two mixtures for about ten to fifteen minutes, until the mixture forms peaks. At this point, your mixture should have the consistency of marshmallow cream. As you finish up the whipping, add the vanilla. Grease up a baking dish – it should be about 9 inches by 13 inches large – with coconut oil. Pour the whipped marshmallow mixture into the baking dish and smooth it out with a spatula. Let the whole thing sit for at least four hours – the longer the better – then flip the baking dish upside down over a cutting board so the marshmallows fall out of the dish. Use a sharp knife to cut the marshmallows into small squares. You can store these indefinitely in an airtight container. There are many health benefits to matcha – it has weight loss properties, as well as anti-aging, immune system-boosting, and cancer-fighting abilities. It has also been proven to help prevent liver disease and cardiovascular disease(5). So be sure to enjoy these simple, easy to make and healthy treats – they’re especially great in cocoa!